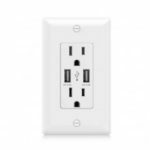 This is a wall outlet with USB ports. 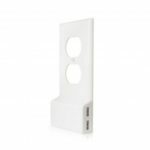 The dual USB ports reach up to 2.4A combined, which is enough to charge your daily electronic devices. 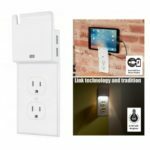 Make charging fast, easy, and convenient in any room of your home! 2.4A 5V DC for 2 USB ports, simultaneously charge your two USB appliance devices very fast without adapters, allow you to spend less time. High efficiency with a low consumption, saving energy and cutting your electricity bills. 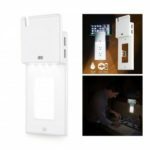 Amper-resistant design and screwless wall plate increases the electrical safety level by preventing the attempting to insert objects in to the outlet or open the plate. Sleek design, creates much needed charging stations while minimizing clutter to your walls and adding more functionality to your home. Back and side wired for easy installation. 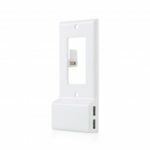 No batteries or special connections required, fit in any standard in-wall outlet box. Compatible with USB 1.1 / 2.0 / 3.0 devices, including Apple and Android products. Perfect for public and private places such as office, cafe, hotels, home and so on.